What a wonderful, exciting, item for the Bunco enthusiasts . 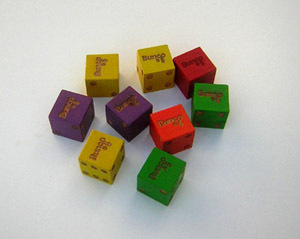 Your own Bunco dice come in assorted colors offered by Bunco Brand Collection. Sure to be the Bunco Fun at your next Bunco Night. Bunco Night and Parties. Bunco gamers or dicegamers the world of fun starts here with these unique Dice used at your party. Whatever the occasion the Dicegamers or Bunco enthusiasts are sure to love these Bunco Logo Dice for the world of Fun and complete their party theme. Fun, festive, creative, and unique all in one. Made for you by Party Bunco® and Bunco®. What a collectors item for the Bunco Enthusiasts.